A reader of this blog has posted several questions and here is my reply. Since the question involves Tirumala Tirupathi Divyadesam, let me take some time to explain some of the temple practices. 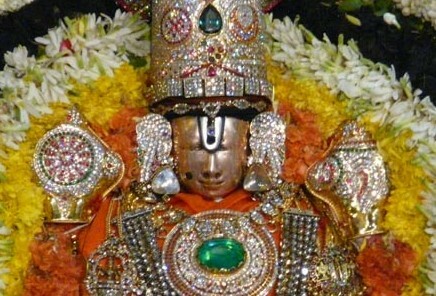 Panchamurthi or Pancha Bera Vidhana Aradhanam is followed in Tirumala. What this means in layman terms is that 5 different idols of Sri Venkateswara Perumal are worshiped . The first is Moolavar or Moola Beram which is Sri Venkateswara Perumal. This is the only deity which is unremovable from the Garbagraham. Apart from these 5 deities that I have mentioned, there are other deities like Sri Ramar Parivaaram, Krishnan, Garudan, Visvasehanan which used during special utsavams. However Utsavar- Sri Malayappa Swamy (With Sri Devi and Bhu Devi) is the one who presides over all the utsavams in Tirumala. Here is a picture of Tirumala Utsavar Sri Malayappa Swami (Picture A). The insignia that HE wears is very unique. None of the other 106 divyadesam Utsavar has a Thiruman Kaapu like his. Picture B – The idol of Sri Srinivasa Perumal used by TTD to conduct Srinivasa Thirukalyanam in various parts of India like Chennai, Bangalore, etc. Picture C – This is the Idol of Sri Srinivasa Perumal that was brought to Singapore for the Srinivasa Thirukalyanam by TTD. 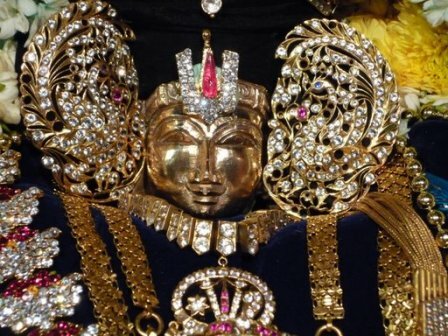 From the above pictures, you can see that the Sri Srinivasa Perumal deity (together with Sri Devi & Bhu Devi) that was used for the Thirukalyanam in India (Chennai, Bangalore, etc) was not the one that came to Singapore. And it is certanly not the Tirumala Malayappa Swami utsavar of Tirupathi. There is no way anyone can dispute this after seeing these pictures. I would like to inform all my readers that the updates I have provided so far are factual. My intention is not to put down anyone; I merely want to present the facts to the readers of this blog. My readers can then decide for themselves and make an informed decision. I am not a Vaikanasa priest but I know how vaikanasa practices should be upheld. My knowledge comes from my many years of being part of all this temple’s activities. All the previous chief priests and other priests of SSPT will also attest to this. I’ve been an ardent devotee and volunteer of Sri Srinivasa Perumal since the age of 5 and so I know just about everything about Sri Srinivasa Perumal Temple. As such, dear readers, I shall continue posting updates on SSPT’s utsavams and rituals etc as and when there is a need to. You can trust that whatever I write on my blog is based on facts and sound vaikanasa principles. I’ll leave you to decide if you wish to accept or reject the information. I did not get a chance to take many pictures today as I was busy helping out with the anathanam. However, I did take a few good shots of Perumal. This was the same alangaram that Perumal was in the previous day (Thiru Kalyaanam day). So, for those who would like to have these photos, you may download them. In the coming weeks, I will share my views about this Thiru Kalyaanam. It will be up to you to agree or disagree with me. Either way, I will share my thoughts and points to ponder with you. As I hadpredicted earlier, the crowd was over whelming and the tentage that they had erected was not able to contain the devotees. There must have been at least 100 over barricades all around the tentage to contain the crowd and it did annoy the devotees quite a bit. I was not able to take some good photograps but I hope to get some later today (20th July). The anathanam will start around 10am or so and this will be served behind the PGP Kalyana Mantabam. Since the space that the temple has allocated is very little, I am sure it is going to be a challenge again to server the food. Here are the photographs taken during during the Thirukalyaanam. If you have taken better pictures, please let me know so that I can share it on this blog. Here are the pictures of day 2 of the Thiru Kalayaana Mahotsavam. Today, the various Hindu temples in Singapore came to offer the varisai to Srinivasa Perumal. Tomorrow, 19th July – Saturday, the Thiru Kalayaana will start from 5PM onwards. The Kalayaana utsavars from TTD are here in Singapore. Sri Srinivasa Perumal along with Sri Devi and Bhu Devi arrived Singapore at about 9am this morning by flight. In today’s function, the Kalayana utsavars were brought around Serangoon road on the Silver chariot and then ceremoniously brought into Sri Srinivasa Perumal Temple. I have taken alot of photographs and they have been uploaded for your viewing pleasure. Due to time constraints, I will follow up on the captions for the various photograps once the Thiru Kalayanam is over. I will be providing more updates and pictures over the next 2 days. Stay tunned..
Work has already started at the Singapore Sri Srinivasa Perumal Temple for the mega event – the Sri Venkateswara Thiru Kalyanam Mahotsavam. However, in my opinion, choosing the temple grounds to host this function has not been a smart move by the temple committee. There are two main reasons why I say this. 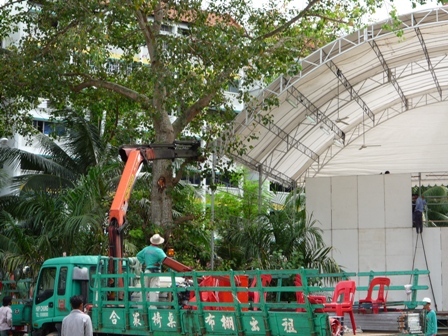 1) The tentage that has been erected will not be able to cater to the thousands of devotees expected on that day. Some of you may dispute this but you will understand what I mean when you come to the temple on that day. 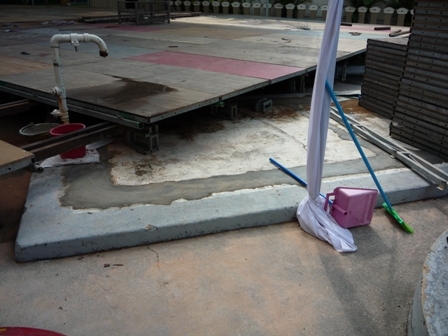 a) Right until last week, there used to be a concrete trough between the temple and the kalyana mandapam. This trough has been in the temple grounds for more than 30 years and was used during the annual Theerathavaari held during the Brahmothsavam and Pavitra Utsavam. 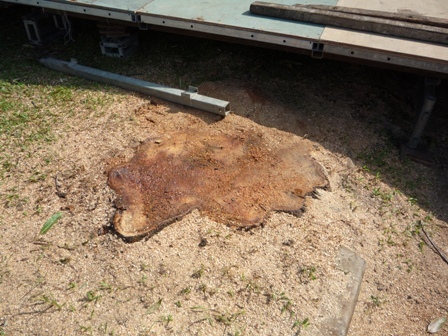 That trough has now been broken and removed to make way for the tentage (picture 1). Sure, once this Kalayaana utsavam is over, the trough will be rebuilt but will this bring back its history?? b) Next, there was a mango tree which has been in the temple since its first kumbabishegam in 1965. The leaves and fruits of this tree were used in numerous temple functions. 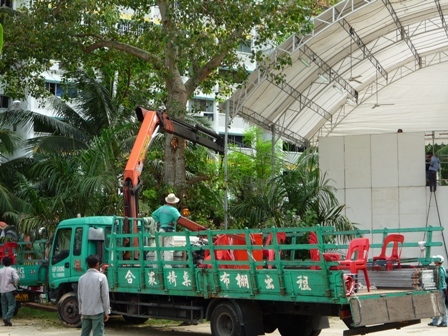 However, since it was blocking the building of a stage, the temple decided to fell the tree without even giving it a thought. Again a part of history just down the drain! I will be proving more updates about the progress in the weeks to come. Post your comments if you have any. Thanks.